Valentine’s Day is here! Each year, 14th February is celebrated as a special day for every lover. Most of the young couples celebrate Valentine’s Day by surprising their loved ones with chocolates, gifts, flowers, and romantic feasts. 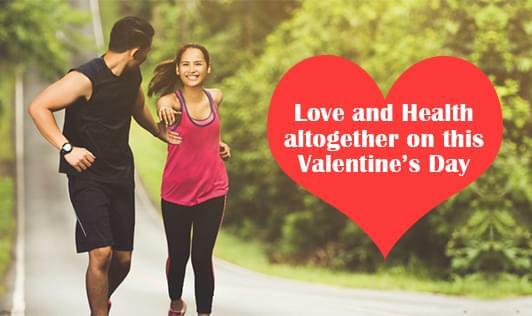 This Valentine's Day, make sure that you take time out from your busy schedule and take some health vows to ensure a nourishing and healthy life altogether. So, here are some health promises you and your partner must take this Valentine's Day. Routine in life is the key, as it helps you to do things in a decided timeframe. Make sure you have a fixed time for meals, exercise, and meditation and encourage each other to follow the routine. Breaking the monotony is important on particular times, but making it a habit can be unhealthy. Engaging in physical activity together is a great idea to spend some quality time. And physical activity does not necessarily mean that you have to hit the gym; you can even play your favorite sports together, like squash or badminton. You can also indulge in brisk walking or jogging together. It’s very important to eat at least one healthy meal together. You encourage each other to be healthy and taking healthy food is one of the best things you can do with your partner. Ensure that you and your partner take a healthy meal together no matter how busy you are. It is not like that you should completely cut junk food from your diet, but you should definitely try to reduce the number of times you consume calorie bombs. Both of you should make simple, healthy and nutritious food choices over sweet and processed foods. Take out some time-out together from your hectic schedules to detoxify your body and give your tummies a break from loading up on so much food. There is no harm in pointing out the unhealthy habits of your partner, such as eating junk food, smoking or drinking alcohol on a routine basis. These unhealthy habits are maybe because of the working environment, peer pressure, or socializing. It is essential to keep a check on your partner developing any bad habits and keep them aware of it. Not just on this Valentine’s Day, but try to include the above-suggested tips for healthy living in your day to day life.